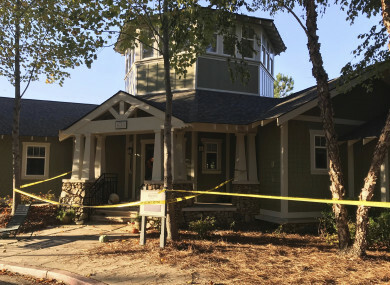 THE FLOOR OF a condominium clubhouse near Clemson University in the US collapsed during a large private party yesterday, hurtling dozens of people into the basement, authorities have said. About 30 people were taken to local hospitals after the centre of the floor caved in at the clubhouse near the South Carolina university. Clemson City Police said nobody was trapped and none of the injuries appeared to be life-threatening. It happened so quickly. I stood up, and everyone was trying to climb out. People are under other people. People are hurt. People are bleeding. I had blood on my sneakers. It was really bad. Terrifying moments caught on camera as floor gives way during Clemson homecoming celebration in South Carolina. Police said they were called about 12.30am yesterday. Ambulances rushed to the scene. “The Clubhouse and pool area is OFF LIMITS to all,” said a copy of the email texted to the AP. Email “Around 30 taken to hospital as floor collapses at South Carolina clubhouse party”. Feedback on “Around 30 taken to hospital as floor collapses at South Carolina clubhouse party”.